On November 6, 1989, Michelle Hagemeister left the Oklahoma Osteopathic College of Medicine in Tulsa, Oklahoma in route to her home near Kiefer, Oklahoma. Later that night, Hagemeister's vehicle was found burned near her home. 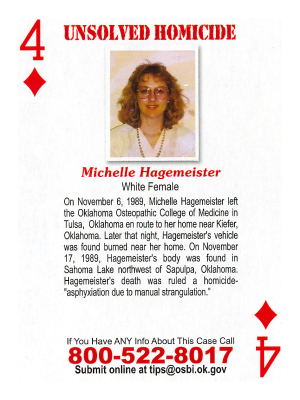 On November 17, 1989, Hagermeister's body was found in Sahoma Lake northwest of Sapulpa, Oklahoma. Hagemeister's death was ruled a homicide, asphyxiation due to manual strangulation.